Changing Spots is one of the do-anywhere quick trick magical effects that leave your audience puzzled and entertained. 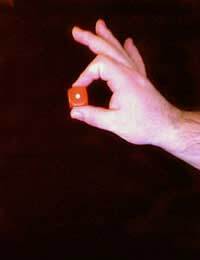 The magician picks up a six sided dice, the kind used in board games and in casinos and holds it aloft between finger and thumb. Rotating the hand back and forth the magician shows the one dot on the front and the five dots on the back, until with a magical wave he turns the dice to show that the back dots have changed to six. An extra twist with the fingers causes the dice to rotate as well as the hand, creating an imperceptible secret move that allows the magician to deceive his audience. A normal six sided dice, preferably the kind with dots instead of numbers. No advance preparation is needed, just an understanding of how to pick up, hold and turn the dice. The motion used in turning the dice under cover of the hand movement is the same concept as something called the “paddle move.” The idea of turning an object under cover - yet right under the watchful eye of the spectator - allows the creation of a whole host of tricks, most of which can be done impromptu with no special props and under complete examination. The magician picks up a normal dice and displays it to the audience, perhaps reminding them how the dice is used as a determiner of chance, that luck and not skill comes into play when rolling the dice. The dice is handed out for examination, and a few rolls can be made if a surface is available. Once the audience is satisfied that the dice is, indeed, genuine and un-gimmicked, the magician is ready to proceed with the trick. The move can be done with any side of the dice, but for the purposes of this instruction let it be assumed the 1 dot, 5 dot and 6 dot are the sides used. The magician holds the dice as if he is making the “okay” sign with his right hand, and the dice is in between the thumb and forefinger; the forefinger is touching the 5 dot side, which is on top. The remaining fingers are flared out, which helps misdirect the eye. The 1 dot is showing towards the audience. Turning the hand over, so that the thumb is now on top, would show the back of the dice, which is the 6 dot - however, the secret move causes the dice to rotate an extra turn, revealing the 5 dot instead. As the hand turns over, the magician pushes slightly forward with the forefinger and pulls slightly with the thumb. This secret move causes the extra turn and is completely hidden in the course of rotating the hand. When the hand is turned back over, so that the thumb is on the bottom, the secret move is reversed, so that the 1 dot is once more showing. It will appear that the 1 dot and the 5 dot are opposite each other, on the “front and back” of the dice. When the magician is ready to perform the magic, he only has to turn the dice over without the secret move and it looks as if the 6 dot replaced the 5 dot. Now the dice can be tossed out once more for examination. The bigger the dice, the more of a push and pull is required to complete the secret move. Practice, practice, practice!